Harold S. Bender standing at rear. George Lewis Bender, leader in the missionary movement in the Mennonite Church, born 2 February 1867, near Grantsville, Maryland, son of John and Elizabeth (Otto) Bender, died 27 January 1921 at Elkhart, Indiana. Of Amish ancestry, his father coming from the Amish community near Marburg (Hesse, Germany) in 1851 to escape military service, he joined the Mennonite Church in his youth, and lived after 1887 at Elkhart, where he was an ordained deacon from 1907 until his death. First a schoolteacher, then for several years a traveling representative of the Mennonite Publishing Co., and finally clerk in the Elkhart post office, his chief contribution was as treasurer and financial agent of the Mennonite Board of Missions and Charities (organized 1905) and its predecessors from 1892 on. By virtue of his gifts he became in this office the outstanding missionary administrator-leader of the Mennonite Church, 1900-1920, as well as the real leader of the Prairie Street Mennonite Church in Elkhart, 1907-1920, during a difficult period. He was also co-founder and treasurer of various other church agencies, including the relief agency of the church. 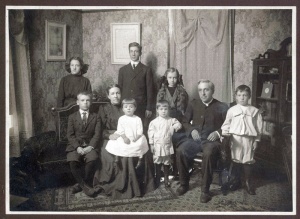 Married to Elsie Kolb, he was the father of seven children, the oldest being Harold S., Dean of Goshen College, another Wilbur J., Dean of Harvard College. Umble, John S. Mennonite pioneers: biographical sketches of some of the leading men and women in the Mennonite Church who have served in the institutions of the church in the home land. Scottdale, PA: Mennonite Publishing House, 1940. Bender, Harold S. "Bender, George Lewis (1867-1921)." Global Anabaptist Mennonite Encyclopedia Online. 1953. Web. 18 Apr 2019. http://gameo.org/index.php?title=Bender,_George_Lewis_(1867-1921)&oldid=104752. Bender, Harold S. (1953). Bender, George Lewis (1867-1921). Global Anabaptist Mennonite Encyclopedia Online. Retrieved 18 April 2019, from http://gameo.org/index.php?title=Bender,_George_Lewis_(1867-1921)&oldid=104752. This page was last modified on 6 December 2013, at 14:32.